The ladies are about to get some dope new kicks. When the Nike Air Max 1 came out, it changed the sneaker world as it was the first time we could see the air unit that was stuffed inside the midsole of Nike shoes. Of course, this was all thanks to legendary sneaker designer Tinker Hatfield. Over the years, the Nike Air Max 1 has been one of Nike's most popular shoes and has gotten a plethora of colorways and reworks. We've seen prints, designs, patterns, and solid colors come to the shoes. It's easily one of the most recognizable shoes in the Nike library and the brand continues to support it. That support is on full display with this brand new women's colorway that comes in leopard print. 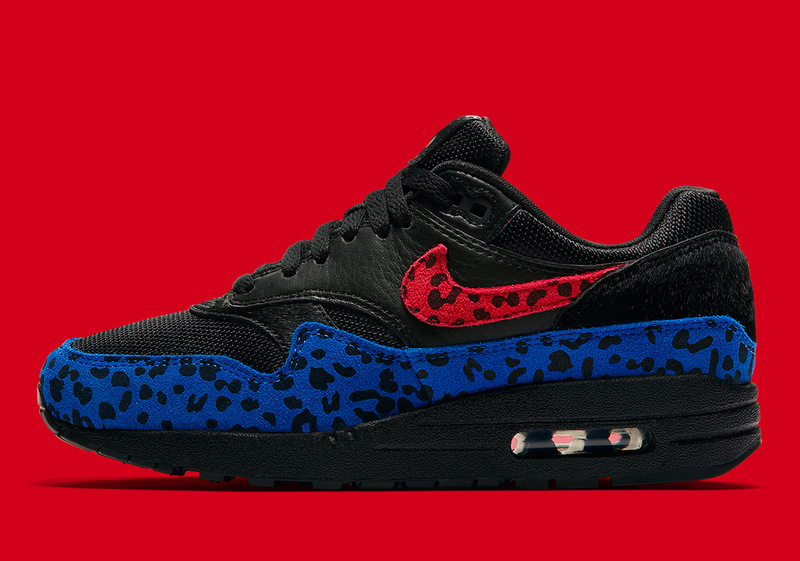 Instead of your typical leopard colorway, these actually have blue and red leopard printing, with a black mesh and leather upper. It's a pretty interesting color-combination when you consider the type of print they've chosen for the shoe. According to Sneaker News, these shoes will be coming out globally on March 1st although there is no concrete price as of right now. Once again, these kicks are for the ladies so only men with small feet will be able to get their hands on this release.